I am getting really excited for the year to begin. No, not the calendar year…the Church’s Year, the journey from Advent to Christmas, to Epiphany and Lent, through Easter and Pentecost, and down into Ordinary Time. But make no mistake: I’m no liturgical expert. After all, this is only my fifth journey through the liturgical year. But there’s so much that I’ve come to love about it. It’s a remarkably refreshing way to mark time. Here is a wonderful new calendar organized around the Church Calendar, yet easily compatible with our Roman calendar of months. For one, it helps us participate in the life of Christ by calling us into a rhtyhm that retraces His life on earth, His death, and His resurrection. Secondly, it helps us celebrate with the wider Body of Christ— connecting us to the Church historic and the Church universal. [MORE RESOURCES ON THE CHURCH CALENDAR: I have excerpted and adapted something from a previous blog to make a new stand-alone blog on the Church Calendar and how observing as a spiritual practice can be helpful HERE. To me, it’s hard to beat the prayers in the Book of Common Prayer (BCP). Find a link to the 1979 version free online HERE. There is also a nice iPhone app with lectionary readings and prayers out of both the RCL and the BCP. Download it HERE. Laboring God, with axe and winnowing fork you clear a holy space where hurt and destruction have no place, and a little child holds sway. Clear our lives of hatred and despair, sow seeds of joy and peace, that shoots of hope may spring forth and we may live in harmony with one another. Amen. O God of Isaiah and John the Baptist, through all such faithful ones you proclaim the unfolding of future joy and renewed life. Strengthen our hearts to believe your advent promise that one day we will walk in the holy way of Christ, where sorrow and sighing will be no more and the journey of God’s people will be joy. Amen. We beseech thee, Almighty God, to purify our consciences by thy daily visitation, that when thy Son Jesus Christ cometh he may find in us a mansion prepared for himself; through the same Jesus Christ our Lord, who liveth and reigneth with thee, in the unity of the Holy Spirit, one God, now and for ever. Amen. Shepherd of Israel, may Jesus, Emmanuel and son of Mary, be more than just a dream in our hearts. With the apostles, prophets, and saints, save us, restore us, and lead us in the way of grace and peace, that we may bear your promise into the world. Amen. My favorite neo-liturgical group is The Brilliance. And their two Advent volumes are spectacular. Full of beautiful, original songs and a few carols and hymns revisited, you’ll find loads of inspiration for your services. Check out their “Advent, Vol. 1” and “Advent, Vol. 2” on iTunes HERE and HERE. For a more classical flavor, it’s hard to go wrong with the King’s College Choir. these choral arrangements are mostly of Christmas carols, not advent songs, but I confess: this is playing in my house all December! Check it out HERE. Though there are many Christmas songs, there are quite a few Advent songs– songs of hope and longing– on this amazing project from Paul Baloche. PLUS…it’s medley-ed with some worship choruses for worship leaders need not fear the lack of congregational participation when doing Advent music and Christmas carols. Genius! Check it out HERE. “Watch for the Light” is a great collection of essays and selected readings from Bonhoeffer to Lewis to many more. Check it out HERE. Richard Rohr’s “Preparing for Christmas” is a great little book of daily reflections for Advent. Check it out HERE. Mark D. Roberts has a nice online devotional that guides you through each week. Mark is an Evangelical theologian, and his devotional includes Scriptures, prayers, and recommended hymns. Check out his free online devotional HERE. Phillip Reinders has combed through classis Protestant confessions and catechisms and put together a wonderful prayer book, called “Seeking God’s Face.” It is Holly’s and my favorite one to use because of it’s straightforward language, clean layout (no flipping pages to look up Scriptures; it’s all printed out), and historic prayers and confessions. Each day includes a Psalm, a Scripture to meditate on, guided “free prayer”, a written prayer and more. Check it out (and “Look Inside”) on Amazon HERE. The resource we’ve used for the past two years is Ann Voskamp‘s devotional and Jesse Tree ornament craft. It was free on her blog, but it looks like it’s now been reworked and revised and compiled into an amazing-looking new book, “Unwrapping The Greatest Gift: A Family Celebration of Christmas” We haven’t tested it out, but it should be good! Check it out HERE. For an evangelical perspective on practicing the liturgical year, you would be hard pressed to find a better voice than the late Robert Webber. His “Ancient-Future” series is a gift to the Church. “Ancient-Future Time” is an easy read, with chapters on specific seasons of the year, making it a valuable reference and resource. Check it out on Amazon HERE. Mark D. Robert’s ebook, “Discovering Advent”, is a short, helpful explanation of Advent. His story of discovering the practice of Advent as an Evangelical pastor late in his ministry life answers the “why” question many Evangelicals may have. Check it out HERE. If you’re up for it, Joan Chittister’s book “The Liturgical Year” is a beautiful explanation of how marking time can be a spiritual practice. Joan is a Benedictine sister and writes from that perspective, but has the modern person and not a monastic in mind. Check out her book HERE. What about you? What resources, prayers or even apps would you add to this list? I’ll forgive you, this one time. 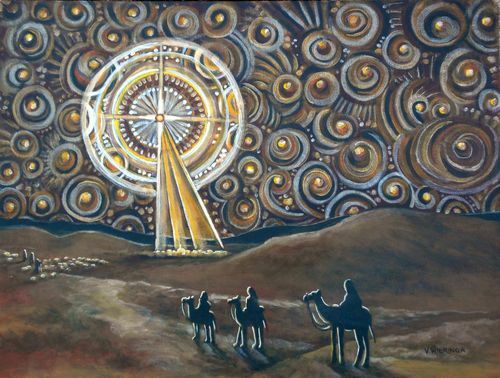 Be sure & check out The Work of the People (http://twotp.com) – beautiful & artistic illuminations & stories designed around the church calendar. Their media for Advent is really good… and they use The Brilliance as the soundtrack many times, too. Amen to all of this. I love the work you do, Glenn. In terms of music, huge AMEN to the Brilliance. My family also listens to Andrew Peterson’s Behold the Lamb of God on repeat all Advent/Christmas. I’d also shamelessly recommend the Merry Christmas. Good Night. collections on Noisetrade: http://noisetrade.com/search?q=Merry+Christmas. Finally, the movie A Nativity Story has made its way into our annual Christmas rhythms. What about you? My family reads Sarah Young’s Jesus Calling every morning.